To access the account settings from the iOS apps, tap on the user icon from the main boards page. You can find this in the bottom right corner on the iPhone or the top left corner on the iPad. Once you’re on the account page, you can add a profile picture, view a list of your teams, sign up for Trello Gold, log out, change your app-specific settings, or access support. To see which Trello user you're logged in as within the iOS app, first open the account settings. From there, underneath your avatar, you should see your @ username. To change your profile picture, first go to the account page, and then tap one your avatar (your current profile picture or a circle icon). This will give you the option to take a new photo, choose from the library, or use your initials instead. 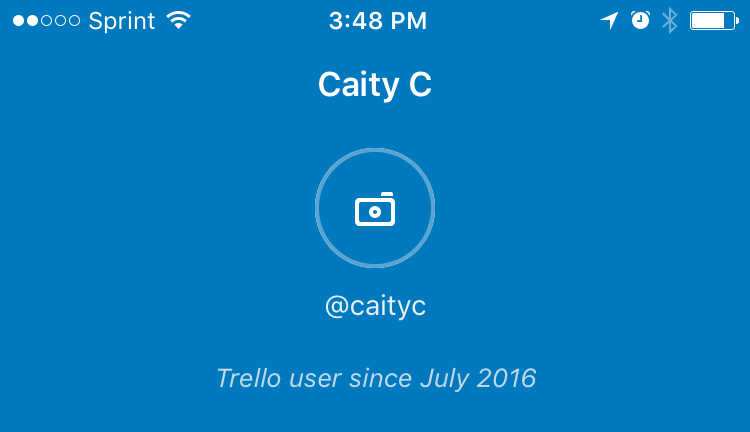 To change account information like your username or the email address associated with your Trello account, you’ll need to log in to Trello in the browser (rather than the app itself), and go to your account settings page there. You can easily access your account settings page by logging in to Trello in the browser and clicking on your name or avatar, and then selecting "Settings".